A heartfelt cry in search of an outstretched hand, Just Seconds Apart’s ambient and vibey “Good to Know” finds the triplet band coming into their own as a formidable pop/rock force. Life has a lot of dark and scary moments – some of which we’re able to overcome on our own, and others that require a little outside assistance. A heartfelt cry in search of an outstretched hand, Just Seconds Apart’s pulsing new single “Good to Know” dives deep for inner strength, while also asking for a sign of some kind to know that things will be alright. When the going gets tough, you persevere at all costs. Still, it sure would be nice to know it’ll all be worth it in the end. 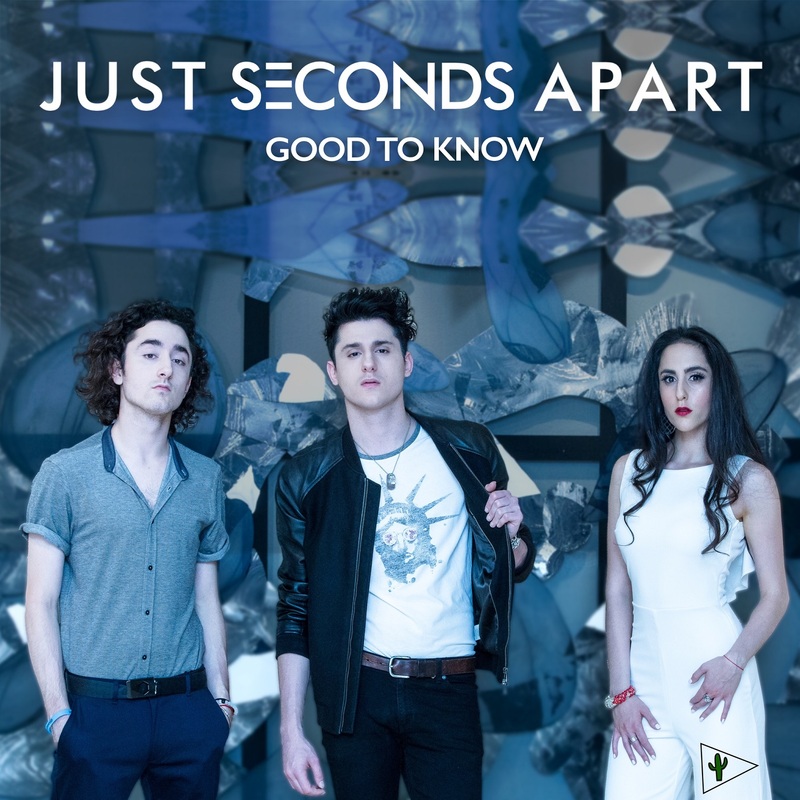 Atwood Magazine is proud to be premiering “Good to Know,” the brand new single from triplet band Just Seconds Apart! The pop/rock trio of drummer Sela, guitarist Ari, and keyboardist/bassist Alex Poulos, Scottsdale’s Just Seconds Apart embrace pop through carefully-curated hooks and feel-good lyrics made to facilitate our emotional experience. For an independent band, their output is impressively pop-perfect: Every beat is primely placed, every inflection purposeful and precise. Debuting in 2015 with a three-track self-titled EP, Just Seconds Apart quickly burst out of their native Arizona and onto the national scene, touring with Plain White T’s in Spring 2017. They made even bigger waves earlier this year with their single “Santorini Dream,” which was featured on Nickelodeon’s Fresh Faces and is currently on rotation on Radio Disney’s RDYOU. Having just finished a summer US tour with Jesse McCartney, Just Seconds Apart are primed and ready to take off. Coming out just as the Poulos triplets turn nineteen years old, “Good to Know” is the band’s most intimate and personal song yet. Not only is it polished and easily accessible, but it’s also deeply meaningful – a trait we can’t say for the majority of music makers in this particular pop soundspace. “The search for fantasy is friends with dopamine.” It’s a choose-your-own-adventure lyric with umpteen interpretations – one that finds the band rejecting short-term highs, or fleeting moments of ecstasy and happiness (it’s really whatever you want it to mean), and doubling down on their commitment to create something longer-lasting, stable, and far bigger than themselves. It’s an emphatic assertion of the self – the alignment of one’s actions with one’s hopes and dreams. As the band noted, despite the lyrics themselves coming from a place of darker feeling, “Good to Know” leans into the light. It imbues all of us with a certain strength and resilience, an inspired determination to persevere and make our own outcomes. Above all, perhaps the most stirring aspect of Just Seconds Apart is their sheer talent. “Good to Know” sounds like it came from one of those pop warehouses, where the hit factory conveyor belt style of creation results in ten or more names on a single track’s credits. “We pulled from Max Martin and Julian Bunetta’s production style and melodic power,” the band mention, noting two of the biggest architects of pop music from the mid-’90s through today. That they pulled it off is one thing; that “Good to Know” carries emotional substance and deep, personal meaning is another altogether. For me personally, pop music shines brightest when it comes from a place of sincerity. That’s not a necessity for all audiences, but it is for me. What sets this teenage band apart is their willingness to be vulnerable and real in their music: To dive into the raw, ugly stuff – uncertainty and self-doubt, fear of failure, and so on. “Good to Know” finds Just Seconds Apart coming into their own as a formidable pop/rock force, and we cannot wait to say we know them when. Stream “Good to Know” exclusively on Atwood Magazine, and be sure to wish Sela, Ari, and Alex Poulos a happy birthday and release day on September 6!